Hey guys, it’s me, Alexx! 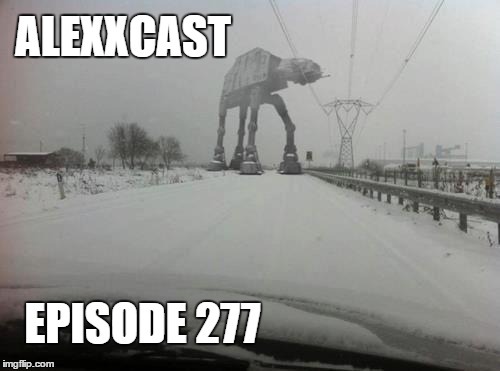 Please consider yourself welcomed to episode 277! Tonight we bring you yet another Alexxcast solo show. This time I’m using the new microphones…. after getting comfortable with the new studio set-up I get to the work of the day: talking nonsense to entertain you, the listening audience. Some of the topics touched on included: How I’d like the world to end; the best movie soundtracks of the 1990s and 2000s; the further elaboration of my dating woes; Portland Snowpocalypse 2017; how to deal with insensitive drive share passengers; what am I like off-mic; what happens when online friends die; a terrible pick-up line website; and I answer some user questions. Enjoy! This entry was posted in Podcast and tagged alex, alexcast, Alexx Bollen, alexxcast, comedy, comic, idiocy, listener questions, podcasting, podcasts, snowpocalypse, soundtracks, Twitter by Alexxcast. Bookmark the permalink.